You're eager to attend Velocity, and why not? It has the potential to help you work smarter, and support your business and career goals. Below are some resources that can help you get approval to attend. Start the approval process early; review the list of discounts to see if you qualify. The conference website and app has useful features to help keep track of your participation. Use the Personal Schedule feature to track the sessions you attend (you must be registered to use this feature). A few weeks before the conference, you'll receive a notification when the Attendee Directory becomes available. Start to note and contact the people you're interested in meeting. During the conference, post about the sessions, tutorials, and training you attend on your social media channels. You’ll gain new followers, grow your network, and your colleagues will see what you're learning. The official Twitter conference hashtag is #velocityconf. After the conference, you'll receive an email with links listing the sessions, tutorials, and training you attended and people you've met (if you've marked them in your Personal Scheduler and Attendee Directory). Review your posts after the conference to recap. Use this information, your social media posts, and the conference Trip Report Template to create a report detailing what you learned. Supplement your own materials with speaker slides and keynote videos, posted during and after the conference. 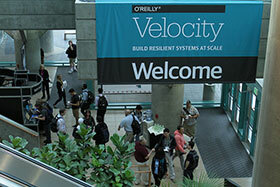 Search for news articles, blog posts, and #velocityconf tweets for additional reference materials to include. The 3-day All-Access Pass also comes with a Complete Video Compilation of all recorded presentations, so you can watch them with colleagues who were unable to attend.